November 22/2010 – This just in! Now you too, can own the Electronic Edition of Chaptered and Versed. Go too Smashwords and buy it now! 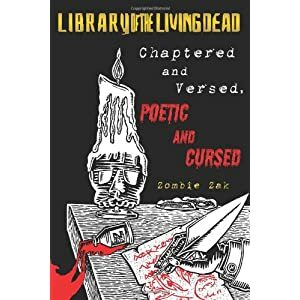 Chaptered and Versed, Poetic and Cursed, is splattered from the unwholesome mind of Zombie Zak in an attempt to distill from the world a moment in time, into something resembling verse and chaotic rhyme. Moments are what define us as a species, and each one carries its own weight and levity. Poetry, the emotional connect, either in its breadth or its brevity. Humor, an important part, in execution as much as in respect to the subject. It’s a tough world we “live” in (some less than others, some more-so), and every day gives way to something new, something fun or something dire, stretching down the turnpike of dismay. This plethora of poetic verse is a stretch both of the morbidly macabre and the absurdly discordant put in some form of place. Don’t forget to feed the zombies – we are especially fond of cookies and brains and bacon, oh my!